Entries under equity (participations) in the financial statement of the controlling company represent the legal union between the individual companies included in the scope of consolidation. When the group is viewed as a whole, this union gives way to total integration of all the companies’ equity. The value of investments recorded in the controlling company’s books is an expression of the percentage of equity held in each subsidiary. When the heading “equity” needs to be eliminated, therefore, this means cancelling the portion of net equity held in the subsidiary. With integral consolidation, the value of the investment in the subsidiary is replaced by the total assets and liabilities of the subsidiary. This means that minority shareholders can also be included in the consolidated financial statement. The value of the investment does not necessarily coincide with the corresponding proportion of net equity. The value of the investment in the subsidiary is higher than the corresponding current value equity portion. This higher value needs to be adjusted depending on what has caused it. There are three possible accounting strategies for dealing with this. The positive difference can be attributed to higher current value of subsidiariary’s assets or lower current value of their liabilities compared to book-values, and occurs when individual assets and liabilities are over or under-estimated. Future operations need to take into account adjustments made to calculate the higher amortisation. The positive difference can be attributed to higher current value of the company which is recoverable through future cash flows. It is entered on the balance sheet as payment for the acquisition of shares on the assets side under consolidation difference. It is amortised according to standard accounting principles. DPC can be attributed to the EC under impairment of investments when it is due to a bad investment or decision that is not directly connected with the operating results of the subsidiary (elimination of a competitor, majority premium). If the assets and liabilities of the subsidiary are to be recorded in the consolidated statement they need to satisfy certain criteria. It is possible to register further intangible assets or alleged liabilities if they meet certain criteria. All assets and liabilities of the subsidiary, including intangible assets, are measured at 100% fair value at time of purchase, regardless of ownership percentage. Following from this, the consolidation adjustments also relate to the interests of minority share holders. However, Goodwill is determined and attributed solely for the majority as an excess of the purchase price on the % of equity at fair value. Any exceptions are stated by the IFRS 3 revised in 2008. Tangible assets = future economic benefits and fair value can be reliably measured. Intangible assets = as defined by IAS 38. Liabilities = probable cash flows and fair value of output measured reliably. Alleged liabilities = probable cash flows and fair value output measured reliably. The IA must be recognized separately from Goodwill. They are governed by IAS 38.
they may be separated – i.e. sold, transferred, licensed or exchanged – either individually or with other transactions. Goodwill (IFRS 3) deriving from an aggregation is no longer amortized. It is instead tested for impairment annually, or more frequently, if circumstances indicate a possible devaluation. No recovery in value. If the value of the investment is less than the proportion of net equity in the subsidiary then there is a negative consolidation difference. The negative consolidation difference needs to be adjusted according to the financial reasons for it. There are three alternative accounting practices for dealing with this. 1. The NCD is due to lower current value of assets or liabilities compared to their book value. Therefore it may be necessary to reduce the carrying amount of assets or increase that of underestimated liabilities in proportion to their current values. The DNC can be entered in the consolidated equity section under consolidation Reserves when the lower price paid by the parent company is indicative of a good deal or in the case of negative goodwill. 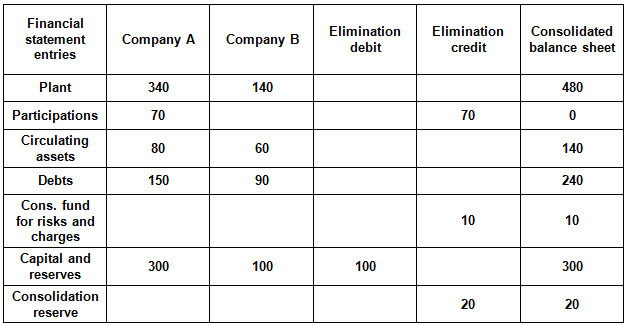 NCD can be recorded in the consolidated liabilities section under the entry consolidation Fund for risks and expenses when the lower purchase price is because negative financial results are expected from the subsidiary in the period post-acquisition. If there is a NCD, after expressing the equity of the subsidiary at a full fair value, the activities and liabilities acquired must be re-examined, including intangible assets, to make any corrections to the values. Any remaining excess must be recognized immediately as proceeds of sale in the Balance Sheet.